existing radio system. Compatible with all Apple iPod now with auxiliary input jack. Back word compatible to most 2007 and up Vehicle. New Dual Mode standard on all USA Spec interface. and Sirius XM right from your iPod. PANDORA – Choose Direct Mode, select your Pandora iPhone app, and pick your playlist! The radio or steering wheel controls allow users to skip forward to next song. LIVIO – Choose Direct Mode, select your LIVIO iPhone app, and pick your radio station! The radio or steering wheel controls skip through to next saved radio station. 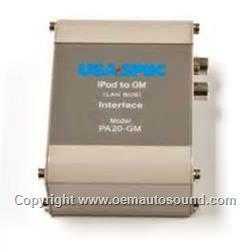 PA20 GM is designed to work in most newer Gm radios with MP3 Capability. MP3 player, Navigation Units, and Rear seat Entertainment.